The beauty of nature is evident in the wildlife and landscape paintings of Wildlife Artist Pat Pauley. 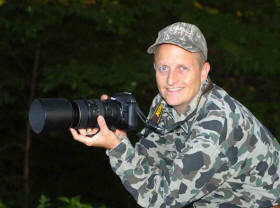 Pat is an easy-going guy who enjoys hunting, fishing, photography and shooting sports. He grew up in Western Iowa where he now lives with his wife, Sandy and their five children. As a big nature enthusiast, Pat brings the outdoor world to life in his paintings with his use of composition and light. Pat gets his inspiration for his paintings from his own experiences in nature and is passionate about conservation and preserving the hunting and fishing traditions he enjoys so much. North American wildlife such as deer, elk, grizzlies, fox, and mountain lions are some of his favorite subjects to paint. Pat also enjoys painting song birds, turkeys, pheasants, ducks and other waterfowl. Pat is also an avid bird watcher and thoroughly enjoys taking his kids out with him to photograph and observe animals in their natural habitat. Pat is a signature member of the prestigious Society of Animal Artists and is also a member of the Artists for Conservation group. His paintings are held in public and private collections. 2014 Artist of the Year for the Dallas Safari Club with "A True Texas Trophy"
“The Chase is On II – Pheasants” chosen by the Society of Animal Artists for the 2009 Art and the Animal Exhibition and National Museum Tour. “Gathering for the Hunt – Wolves” chosen by the Society of Animal Artists for the 2008 Art and the Animal Exhibition and National Museum Tour. This painting was also chosen by the National Timberwolf Alliance as the 2006 print of the year for the Great Lakes Region. “Shoreline Seclusion – Wood Ducks” chosen by Oklahoma Ducks Unlimited for the Sponsor Print for 2007/2008. “Shoreline Seclusion – Whitetail Deer” chosen by Society of Animal Artists for 2007 Art and the Animal Exhibition and National Museum Tour. · “Master of the Plains – Bison” was commissioned in 2005 by the Badlands National History Association and is on permanent display in the visitor center at the Badlands National Park in Interior, South Dakota. “River Discovery – Eagle” and “Unseen Challenges – Elk” were commissioned in 2005 by the Missouri River Basin Lewis & Clark Foundation in honor of Lewis & Clark’s 200th anniversary celebration. These paintings are on permanent public display at the Missouri River Basin Lewis & Clark Interpretive Center in Nebraska City, NE.